If your company works with lawn sprinklers and irrigation, some of your customers may contact you by way of referral. Most others will seek your service on the web. If they do go there to find you, what impression do you make? Is your online presentation among the most distinctive? Depending on your location, you might have many competitors vying for your web-based customers. It’s vital that your website make an instant statement about your skill, experience and professionalism. Weblinx, Inc. specializes in web designs for lawn-care companies. We provide the style and function that make your website a high-powered sales and marketing tool. We can also help you connect with more customers through better search engine rankings. Western Irrigation is a member of The Irrigation Association and The Illinois Green Industry Association. Their company and employees are registered with The State of Illinois Department of Public Health in compliance with Illinois state ordinance. The WI foreman have over 40 years of experience and will install your lawn sprinkler system in a timely and professional manner with little to no damage to your existing lawn and landscaping. Weblinx created a visually appealing website that included the following features: HTML, CSS, E-Mail Contact Form. Weblinx is an industry leader providing irrigation company web design solutions. 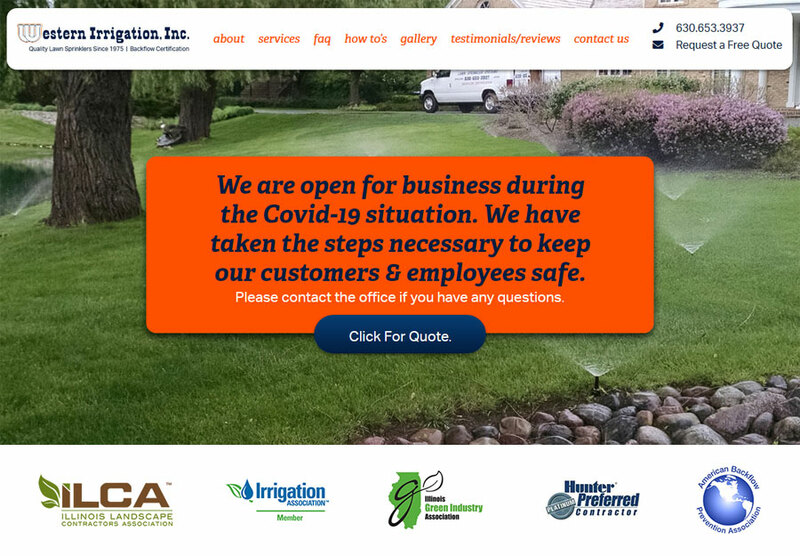 Our mission is developing unique sites for irrigation companies and lawn sprinkler companies that create brand awareness and increase the customer base for our clients. Weblinx specializes in web development and digital marketing strategies for firms that provide Irrigation and Lawn Sprinklers.